This is a modified worksheet from the middle school geometry curriculum. It is excellent for special education students who require an alternate or modified curriculum. This worksheet includes three circles, each with the radius given. Students are to find the diameter and write the answer on the line. Another option is to give students the three answers and have them paste the correct number on each line. There is a hint under each radius's length to explain to students how to solve the problem. A documentation box is in the top right hand corner for easy IEP documentation. 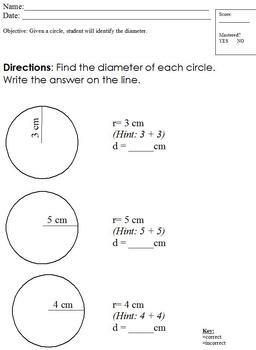 2.A.1.c Given a circle, student will identify the diameter.